With technology blurring lines, raising expectations, and challenging retailers to keep customers walking through their doors, customer service has taken on a completely new level of implementation and importance. A recent survey by the Temkin Group identified Ace Hardware, BJ’s Wholesale Club, and QVC among the top retailers in customer service, while Sam’s Club, Amazon.com, and Dollar Tree earned honorable mention (rated among the top 10%). Interestingly, the bottom of the list, scoring under 70% includes retailers that have been appearing in 2017 headlines for store closings. 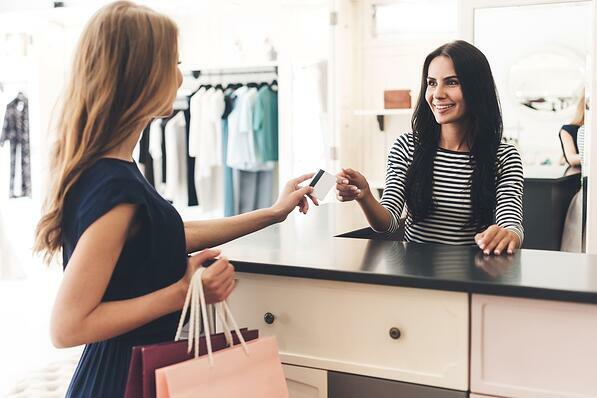 Identifying customer service as one of the advantages in-store shopping has over online shopping, TimeTrade reports 85% customers buy more when they receive personalized service. The takeaway is that customer service can ultimately affect a retailer’s rise and fall. These also mirror retail trends, which point to personalization/customization, convenience, and community being at the top of shoppers’ lists when it comes to deciding where to spend their money. So, why not start at the top to explore the best customer service practices for retailers to follow. What is it about their customer service that sets them apart from the other retailers? How easy is it to work with your company? Convenience. Customers no longer desire it; they expect it. On this customer service element, companies like Amazon.com have rated 79% in Temkin’s survey for customer experience. Offering options such as 1-Click shopping and free shipping options will always satisfy your customers need for convenience. Sam’s Club employees from the top down are trained to concentrate on the customer, which involves designing a shopping experience from the perspective of the customer. For example, customers like to use smartphones so Sam’s Club was the first warehouse chain to offer WiFi in all its stores. While retailers must customize these tips to fit their industry, customer base, and budget, the principles can be applied to any scale. When asked to rate their success, effort, and emotion in this latest survey, the 10,000 customers overwhelmingly chose companies that personalize the shopping experience, offer convenience from the shoppers’ perspective, and build relationship and community among its customers. This is a recipe for success in customer service.